The Engineer of the Year is the individual who distinguishes himself/herself in service to the Society and the healthcare engineering profession during the most recent calendar year. Distinguishing qualities may be their service to their institution, their chapter, fellow engineers, and the Society as a whole. The award is not recognition of continuous years of service. During 2018 (and over the nominee’s career), the candidate has displayed commendable leadership qualities. 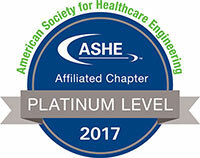 During 2018 (and over the nominee’s career), the candidate has ably represented the interests of the New England Healthcare Engineers and the hospital healthcare engineering profession. The candidate has provided technical and/or professional assistance to other healthcare engineers. During the previous year(s), the candidate has published article(s) or technical document(s). Within the preceding 12 months, the candidate has received professional recognition, met the requirements for an academic degree, and/or achieved professional certification within an engineering related discipline. The candidate has made significant contributions within the healthcare engineering field. The candidate has shared programs or other information with fellow engineers that has helped them improve the overall effectiveness of their operations. The candidate displays high levels of integrity and professionalism. During 2018, the candidate has devoted significant amounts of time to a project that has brought positive (outside) recognition to the Society and its members. This candidate has served on a Committee (State/Local Engineering Societies, NEHES, ASHE, NFPA, ASHRAE, ASME, AIPE, etc.) and has contributed to the overall improvement of the membership. The candidate has contributed to both the cohesiveness and organization of the Society and has promoted cooperation between members. The candidate has hosted meetings and/or organized educational programs. Click on each decade below to reveal the Engineer of the Year winners.